I love the way this plant brings bees and butterflies into a natural area. Beebalm is native to Eastern North America and is an ingredient in mouthwash as it has a slightly minty taste and smell other may say the scent is closer to Earl Grey Tea. It is a flower with many uses; the indigenous Blackfeet Indians would often use this plant as an antiseptic for minor wounds and skin infections. Beebalm can reach heights of 3 feet and can grow to 1 foot in width. It may have some trouble with slugs and also powdery mildew, but otherwise, it has no other problems. The flowers bloom around early summer time which give way to green light but slightly dark red flowers, they will stay red all through the fall. Remember that every three years you should lift and divide. 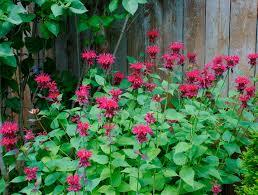 Beebalm will tolerate a wide range of soils except for excessively wet soils.